In April 1945, I was assigned as leader of the 3rd Haja Unit of the Army's 433rd Shinbu Special Attack Squadron (made up of 15 Type 97 Fighters ). We proceeded to Bansei Air Base in Kagoshima Prefecture from Shihei in Manchuria by way of Hoten, Keijō (Seoul), and Taikyū (Daegu). At dawn on May 29, all 15 planes took off toward Kadena and Nakagusuku Bay at Okinawa . Along the way there were some that met American planes, and the weather worsened so we landed at Tokunoshima Base  for a short time. The 250-kg bombs were attached again, and we took off in stormy weather with dark clouds hanging low. Contact with the other planes was lost. At the moment when my plane turned right at an opening about 20 meters wide along the surface of Mount Katsuu  (450 meters in height), the wingtip touched that forest road, and my plane crashed down. This happened about 8:30 p.m. on May 29. When I started to regain consciousness, the first thing that reached my ears was the croaking of frogs. My plane's engine had been blown off, and the 250-kg bomb had stuck standing up in the rice paddy right below me. I could not move my body except for my right hand, and blood was running from my forehead. I was struck by intense pain from bruises and broken bones all over my body. Later I found out that there were broken bones in 16 places. A large lever had pierced my throat, and parachute cords were hanging around my neck. I could not do anything with just my right hand. Soon I was found by some villagers, and they pulled me out from my broken plane and hid me in a nearby cave. However, before I knew it, all of the villagers were taken away to an American POW camp. With serious injuries, I began my solitary life. My wounds were crawling with maggots, and I lived a bedridden life. One day brothers of 7, 5, and 3 years old appeared before me. The three children did as much as they could for me who was wounded. They boiled taro leaves and took out rice from a pot hidden in the ground in order to cook it for me to eat. They were the persons to whom I owe my life and who provided support to me in my solitude as I strayed at the boundary of life and death. I was hiding quietly in the cave in this way for more than 50 days. Until I came down from the mountain on October 29, I could not free my mind for even a moment from the fear of becoming a POW and the fear of the approach of a habu (poisonous snake on Okinawa) toward my disabled body. However, what provided me support more than anything else in my desperation was the sacred rice that I had received at Keijō Daikyōkai (Grand Church) and remained safely in my pocket. In those days I was a devout third-generation Tenrikyō believer, and I usually kept the Kyōten (Doctrine of Tenrikyo) book at my breast. When I crashed, it was due to this Kyōten that the control stick did not pierce my chest. I was saved by the Kyōten, and after such a long time I am deeply grateful for God's blessing. It was assumed that I had died in battle near Okinawa, and my family register shows a death notice that I died on June 1. An enshrinement notice from Yasukuni Shrine also came. However, after I landed safely at Uraga on March 29, 1946, a death retraction notice was issued in May. In May 1972, I went to Okinawa after 27 years had passed. 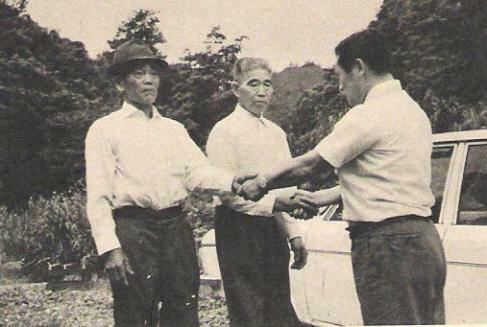 I met the brothers Kōmei and Kōki Iraha who had saved my life by carrying me on their backs to the cave. Both of them had already passed 80 years of age, but they remembered me well, and we hugged each other crying. The experience in Okinawa was a sublime experience that I will never have again in my life. Looking back, the number 29 mysteriously has been attached to me. The day I crashed on Okinawa was May 29. I went down from the mountain on October 29. The day I returned was March 29. The birth of my oldest son was on January 29, 1949. I became a Tenrikyō church head minister on October 29, 1954. My grandfather became a full-time minister on January 29, 1894, and he died on April 29, 1930. I believe that the living god has set this up for me to not forget my ancestors. Makino, Kikuo, ed. 1979. Ichioku nin no shōwa shi (Nihon no senshi 4): Tokubetsu kōgekitai (Shōwa history of 100 million people (Japan's war history, Volume 4): Special Attack Corps). Tōkyō: Mainichi Shinbunsha. 1. Japanese sources (e.g., Naemura 1993, 515-7; Osuo 2005, 207; Tokkōtai Senbotsusha 1990, 284) indicate that 433rd Shinbu Squadron pilots flew from Bansei Air Base in Type 2 Advanced Trainers, not Type 97 Fighters as mentioned in the story. 2. Japanese sources (e.g., Naemura 1993, 515-7; Osuo 2005, 207; Tokkōtai Senbotsusha 1990, 284) do not give May 29, 1945, as the date that all 15 433rd Shinbu Squadron planes made their sortie from Bansei Air Base. Instead, Naemura and Osuo list the following number of 433rd Shinbu Squadron pilots who made sorties for a special attack and did not return: 5 on May 25, 5 on May 28, and 1 on June 1. The list of pilots who died in special attacks in Tokkōtai Senbotsusha gives slightly different numbers: 4 on May 25, 6 on May 28, and 1 on June 1. No information is provided in these sources related to the 4 squadron pilots, including Yoshihiko Konishi, who did not die in battle. 3. Tokunoshima is a small island about 100 kilometers northeast of the northern tip of Okinawa. The Army hurriedly constructed an air base on the island in 1944. 4. Mount Katsuu is located on Motobu Peninsula in the northern part of Okinawa.